This dish is the perfect one pot meal to perk up your taste buds! Lemon and dill make this mediterraniean inspired pasta dish super fresh, and tahini and nutritional yeast provide the creaminess. Tahini is a staple in our pantry for making homemade hummus and creamy salad dressings, plus its packed with iron, calcium and protein. The whole thing cooks in one pot, so cleanup is a breeze! Heat olive oil over medium heat in a large pot. Once the oil is hot, add the onion and cook until translucent and just beginning to brown, about 5-7 minutes. Then, add the carrot, and garlic, and cook for an additional minute. Add the vegetable broth to the pot and bring to a boil. Once boiling, add the orzo, and ook for 7-10 minutes, or until the orzo is al dente. 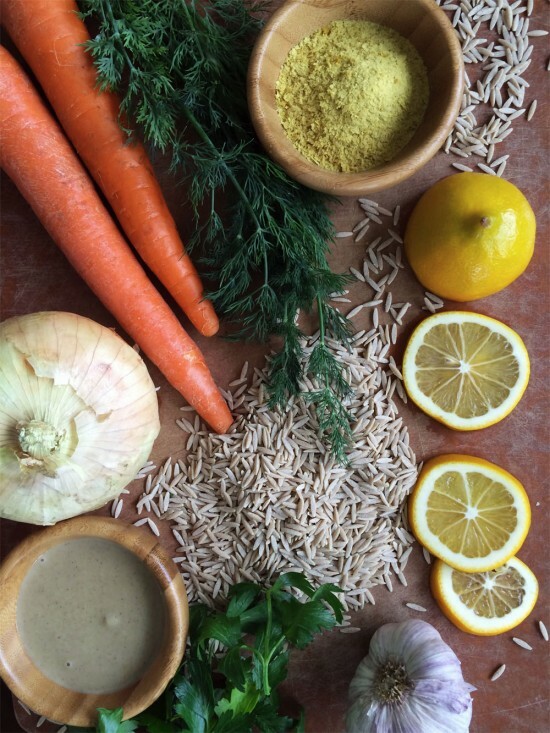 While the orzo is cooking, mix together the tahini, nutritional yeast, lemon juice and zest in a measuring cup. 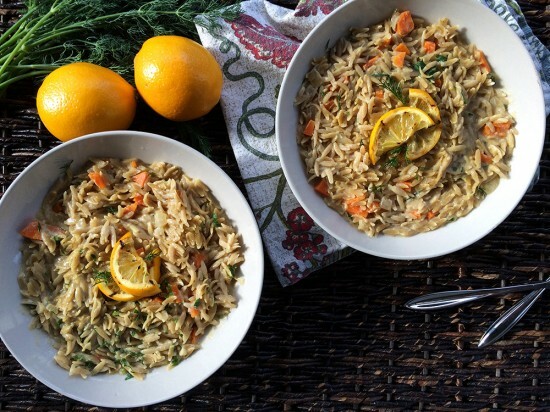 When the orzo is done cooking, remove from the heat and stir in the tahini mixture as well as the fresh herbs. Serve warm with extra lemon and dill on to. Note: Alternatively, this dish is amazing with fresh rosemary in place of the dill. Instead of 1/4 cup of fresh dill, used 1 tablespoon of fresh chopped fresh rosemary. Official taste tester! Super creamy awesomeness! Yum! I’ve been wanting to try my hand at making Risotto!